Each year, the Anvil team predicts trends for the following year and evaluates accuracy of predictions from the previous year. 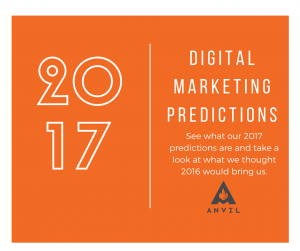 Soon to hit the newswire, here is a look back at our top 3 2016 digital marketing predictions as well as a look ahead to 2017, as predicted by the Anvil team. Anvil’s 2016 Marketing Predictions: How did we do? Experience Is Everything. Google has put ever-increasing emphasis on user experience in its ranking algorithm the past few years. This trend will only become more apparent as websites with a well-designed interface and thoughtful navigation will outrank sites with similar domain authority. A quality user experience will also factor in multi-screen user access via responsive design yet also factor in ADA considerations and social integration. Look for website being rewarded (or penalized) based on its user experience in 2016, whether via a major algorithm update or through a series of smaller tweaks and discussions in the search marketing community. Grade: A-; While this prediction has largely come to fruition, it was also a relatively safe bet and will continue to be a factor moving forward. Designers have to consider multiple device types and browsing behaviors when designing a website and Google will continue to reward the best user experiences. Brands Will Go Native. With ad blocking becoming more prominent with consumers, brands are forced to get more creative. While it’s a safe bet advertisers that will increase their investment in native advertising, we predict the investment will be both significant and unsurpassed in 2016. Similar to our prediction that 2009 would be The Year of Mobile, this trend may be somewhat premature (as we are early adopters) but the growth rate will raise eyebrows on Madison Avenue. Related article: How ad blocking will change digital advertising. Grade: B+; While there has been a significant increase in the adoption of native advertising, it has not been at the rate we expected. This may be due, in part, to the slower growth curve of ad blocker usage. Regardless, agencies and brands will continue to invest in native advertising moving forward. Better Analytics = Better Marketing. We believe 2016 will be the year brands reap the benefits of significant investment in analytics platforms and integration with other marketing and measurement systems. CMOs and CTOs will increase their value to large organizations will smaller marketing departments will benefit from more affordable alternatives. With improved measurement platforms, expect to see brands renew focus on cross-channel tracking, multi-touch attribution, real-time and predictive analytics. Specifically, look for significant growth in analytics revenues, venture funding for new or evolving platforms and a higher profile for analytics within the C-suite. Grade: B; The analytics industry did see a good deal of activity and investment in 2016, but the costs have not decreased substantially, nor has the functionality evolved significantly over the past year. Like many predictions, it’s a relatively safe bet this trend will continue indefinitely. 2017 Will be The Year of Video. We’ve all searched YouTube for informational or entertaining videos over the years, but 2017 will be transformative for video. With a 5x higher recall than the written word, video is the most engaging media format and most effective in assisting conversions. Mobile search volume has surpassed desktop, so more video is being consumed than ever before. Affordable data plans, improved bandwidth and widespread Wi-Fi access has reduced the cost and improved the overall mobile video experience. Another factor is the evolution of content marketing, incorporating increasing amount of video. Video production costs have decreased dramatically, both in terms of the quality of mobile phone video, affordable or embedded editing software as well as digital SLR and 4K video cameras. Video form factors have evolved as well: live streaming (on platforms like Facebook), 360-degree video, augmented & virtual reality and best of all, drones, all make the video capture and viewing experience more dramatic and immersive. Even business-to-business brands are getting into the mix with demos, tutorials and testimonials. Last but not least, video advertising is exploding and will offer new opportunities for targeting and engagement display and text ads lack. If your brand isn’t doubling down on video in 2017, you will miss the bus. Mobile Page Load Speed Will Make or Break Your Business. By the end of 2017, having your website AMP’d will be required as AMP’d pages will be a ranking factor for Google. October of 2016 was the first month when mobile Internet usage surpassed desktop. Mobile traffic has been growing much faster than desktop for several years and has now surpassed desktop. Additionally, Google has made significant moves to favor mobile; the switch to a mobile-first index and splitting its index in two (one more frequently updated mobile index, and a less frequently updated desktop index) and the introduction of AMP pages. AMP consists of three different parts: AMP HTML is HTML with some restrictions for reliable performance and some extensions for building rich content beyond basic HTML. The AMP JS library ensures the fast rendering of AMP HTML pages. The Google AMP Cache can be used to serve cached AMP HTML pages. If you don’t have AMP pages, then you absolutely have to have your site optimized for mobile page speed, even if your site is already “mobile-friendly.” Users are going to grow accustomed to the light speed loading time of new AMP pages and will not have the patience to wait for your site to load. You will lose out of customers, no doubt. Paid Search Will Move Further into Programmatic. With Google’s public release of new features centering on audience targeting in 2016 (remarketing lists for shopping, demographics for search, customer match), the search giant will make further strides in 2017 toward programmatic search. Moving away from specific keyword targets, Google will give advertisers more ways to target audiences specifically and prioritize those automated and programmatic ways over manual inputs. We predict at least three additional automated/audience-targeted features to be released in 2017. Look for the full article on iMedia soon, or let us know you’d like a copy and we’ll make sure you receive it!